Carnival Vista takes cruisers to new horizons. Carnival Vista might be described as a blushing bride, in that she brings something old, something new, something borrowed, and something blue to the horizon. As Carnival Cruise Line’s newest flagship — its first new ship since 2012’s Carnival Breeze — the 3,936-passenger Carnival Vista most definitely borrows from founder Ted Arison’s concept of cruise vacations for all, while floating out new or expanded Fun Ship concepts. A unique atrium concept sets the mood with the multi-deck, mushroom-like Dreamscape sculpture that features colorful ever-changing LED screens. There’s also the first IMAX Theatre at sea — a 187-seat, three-deck-high screen that shows first-run movies, family favorites, and documentaries — as well as a multidimensional Thrill Theater experience with amazing effects and visuals. Both theaters are part of the new Carnival Multiplex, which comes complete with a concession stand. Other new entertainment options include Playlist Productions’ three new shows that combine live performances with LED staging and special effects. Amor Cubano: A Caribbean Dance Romance blends classic Latin songs with today’s hits; Flick: The Power of Motion Pictures celebrates some of the greatest songs in film; and America Rocks! is a high-energy rock show made up of American classics — complete with glow sticks and all. For more fun new features, look up. 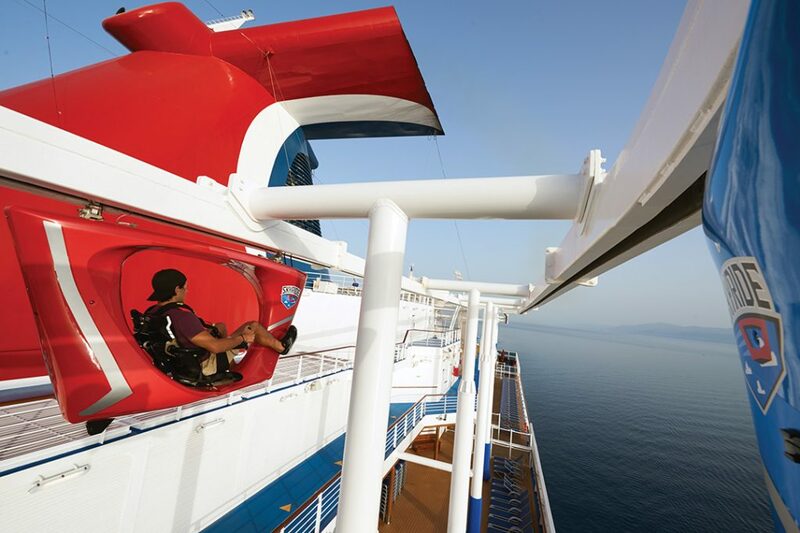 As part of the ship’s SportsSquare, you’ll find the challenging SkyCourse ropes course found on other ships, but on Carnival Vista, you can’t miss SkyRide, a first-of-its-kind attraction where riders pedal hanging recumbent-like cycles at speeds of up to 18 miles an hour across an elevated 800-foot-long track for wild adventures with spectacular views. The ship also features Carnival’s first raft slide, the 455-foot-long Kaleid-O-Slide, where riders zip in inner tubes down corkscrew turns enhanced by music and psychedelic kaleidoscopic effects. The Clubhouse at SportSquare is a cool indoor sports hangout with mini-bowling, a soccer-like pool table, ping pong, and more. Dining concepts exclusive to Carnival Vista include the casual Seafood Shack, which is definitely one of the ship’s tastiest additions. It serves fresh options such as New England–style clam chowder, lobster rolls, lobster BLTs (highly recommended by Carnival president, Christine Duffy, who knows her lobstah), steamed seafood, oysters, and more. There’s also the unique ability to purchase locally sourced seafood, which can be prepared-to-order immediately or pre-ordered and delivered, served, and enjoyed wherever guests are dining that evening. In addition, the line’s first purpose-built Chef’s Table VIP in-galley dining experience is limited to 16 lucky foodies. The experience starts with cocktails, hors d’oeuvres, and a galley tour before proceeding to an eight-course dinner of impressive appetizers, entrées, and desserts (all paired with wines) that are not found on Carnival’s regular menus. New accommodations and amenities exclusive to Carnival Vista include Family Harbor and Havana staterooms and suites. The large Family Harbor area is a dedicated zone with family-friendly nautical-themed accommodations including large oceanview cabins with two baths that accommodate five family members. The Family Harbor Lounge is an exclusive 24-hour area with breakfast, snacks during the day, concierge service, board games, family movies, video games, and more. The new Havana staterooms and suites are exclusively located near the Havana Bar & Pool and feature unique tropically inspired décor. Havana Cabanas boast an extra-large outdoor space complete with a hammock, and Havana Cabana suites offer even more space, plus a luxurious rain shower. There are four areas of new technological leaps forward. 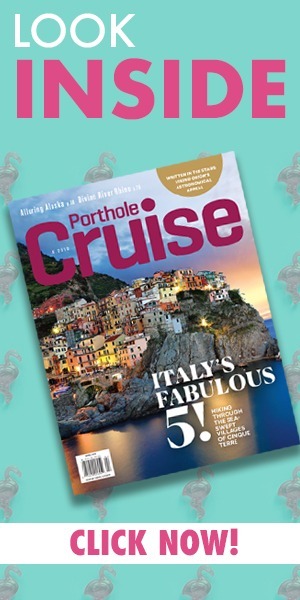 In the staterooms, large flat-screen Carnival Hub TVs feature more free and pay-per-view movies than ever, lots of ship programming and information, and easy access to passenger accounts, photography, and more. The new digital photography offerings include the busy, colorful, and open Pixels area, with easy and quick access to pictures and printing —without the previous waste of time and paper. The expanded and free Carnival Hub app keeps smartphone users up-to-date on daily offerings, as well as features a social network to connect with family and friends on board. Plus, the Internet speed and package prices are also better than ever. Old, Borrowed … and Expanded! Carnival veterans will note that Carnival Vista also “borrows” many of the line’s Fun Ship 2.0 concepts that have been well received, with expansion and tweaks that make them better than ever. Notably, the size of the ship allowed the line to greatly expand some of its signature concepts. For example, RedFrog Pub & Brewery headlines the places to say “cheers,” in that it’s the line’s first onboard brewery. Paired with its ever-popular ThirstyFrog Red Ale, new onboard-brewed Caribbean-inspired choices from the large copper-topped glass kettles include the aromatic and citrusy Port Hoppin’ IPA, spicy ThirstyFrog Caribbean Wheat unfiltered lager, and creamy FriskyFrog Java Stout. Live music, more outdoor seating, brewing tours, tastings, and tabletop self-serve taps make this place more popular than ever. The expanded Havana Bar is another hotspot, with evenings typically filled with Cuban-inspired libations and live music. This venue is sure to be even more popular when Carnival Vista is based in Miami for year-round Caribbean sailings starting this winter. Already known for some of the best deck parties at sea, Carnival Vista ups the volume with three new options: the Island Deck Party, celebrating the fun and spirit(s) of the RedFrog and BlueIguana, the ship’s poolside watering holes; a Rock-N-Glow ’80s Deck Party, with Day-Glo and other ’80s attire and music; and adults-only Serenity’s South Beach–style club party under the stars. So what’s “blue” on this new oceangoing bride? That’s easy. The ship’s designers made a concerted effort to bring the sea even closer to guests through the use of lots of varied blue hues in the ship’s décor, artwork, tiles, carpets, and more. In addition, the creation of even more outdoor spaces means guests can marvel at azure waters and tropical sunsets from one of several waterside venues. The now-sprawling Bonsai Sushi, for example, offers cooked-to-order Asian delicacies along with outdoor seating, and Fahrenheit 555, the Cherry on Top sweet shop, and the Library Bar also offer al fresco options. In addition, the adults-only Serenity area boasts the addition of a large bar and custom salads at lunch, and the ship features the line’s largest WaterWorks water park, complete with spiraling waterslides, a giant water bucket, an expanded SplashZone, water toys, and more. Whether dining or drinking, sunbathing or swimming, there is no shortage of space to relax and feel close to the sea. 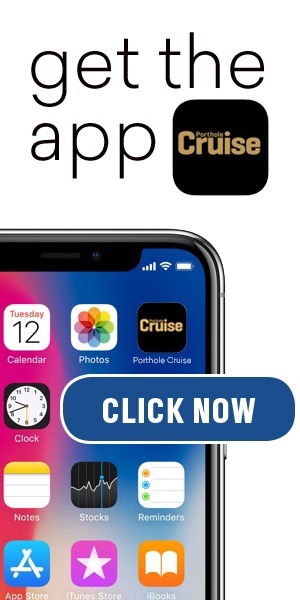 After all, isn’t that was cruising is all about? Carnival Vista debuted in early May and sailed a summer schedule of Mediterranean cruises through October. Following a trans-Atlantic crossing, the ship will offer a pair of 11-night voyages from New York in November before repositioning later that month to Miami for year-round Eastern, Western, and Southern Caribbean sailings.